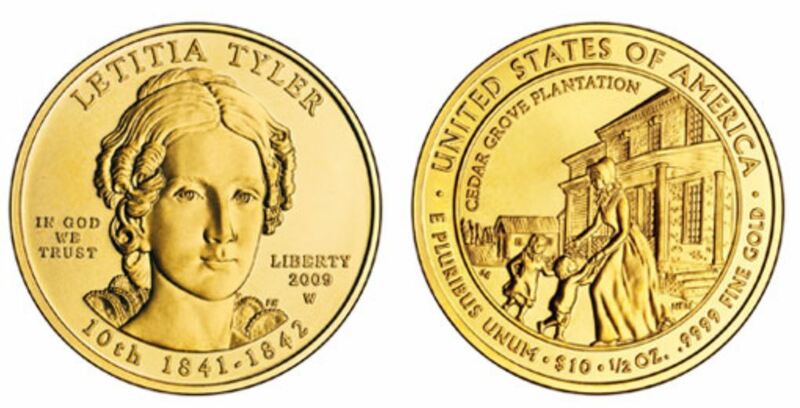 First Spouse or First Lady gold coins were first issued in 2007. They are being produced by the US Mint in the same chronological order as their husbands served as President, and only some of the spouses have been issued so far. These attractive gold coins are aimed at the collector market, though they are legal tender and have a face value of $10. The coins weigh half an ounce and are .9999 pure gold, or 24 karat gold. The obverse features a portrait of the first lady in question (Liberty in the case of Jefferson), and their name, and the dates they served. The reverse sides are variable, except that they all state the weight and face value of the coin, and show a scene from or something characteristic of the first spouse’s life and activities. Cheap bronze reproductions of the coins are also being issued, with no face value.